The skin of the face is developed from ectoderm covering frontonasal, maxillary and mandibular processes. The facial skin is thin and highly movable. In the region of the chin, it is thick and firmly fixed. The facial skin has profuse blood supply. It is provided with innumerable number of sweat and sebaceous glands. So acne is more common in the facial skin. The cutaneous glands are directly influenced by the oestrogen or testosterone as the case may be. Deep to the skin the superficial fascia is loosely situated. This fascia contains only areolar tissue and fat. This permits spread of oedema or inflammation. The skin over the alae of the nose, lower part of bridge of nose, and vestibule of the nose, is firmly connected to the cartilage. So inflammations are highly painful. Free mobility and vascularity of the skin and subcutaneous fascia, permits the plastic surgery ‘par excellence’. The superficial fascia of the face contains muscles of the face. These muscles are derived from the pan- niculus carnosus system of muscles. These muscles are inserted to the skin of the face. Hence dimples may develop during the action of these muscles. 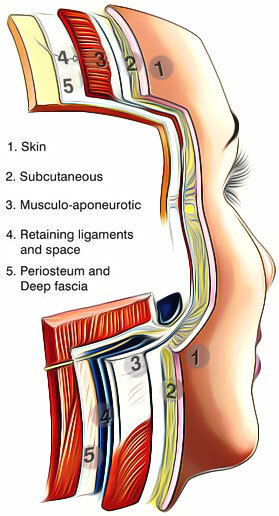 Facial artery, vein and nerves of the face are found within the superficial fascia. Hence minor injury may cause major bleeding. The arrangement of beard and moustache are secondary sexual characters. They are arranged around the oral fissure in male. The dangerous area of the face is constituted by upper lip, tip, alae and philtrum of the nose. Infection from these areas spread through the blood and may produce intracranial infections. Nasolabial furrow is obliquely directed. It passes downwards and laterally. It lies between cheek and lateral border of the nose. This furrow disappears during facial nerve injury. At the oral fissure, muco cutaneous junction is situated. Corpus adiposum of the cheek is the buccal pad of fat which gives smooth appearance for the cheek. In children it is more developed and helps sucking. Hence it is called suctorial pad of fat. Deep fascia is absent in the face except over the parotid gland. Here the investing layer of deep cervical fascia forms the parotido-masseteric fascia.